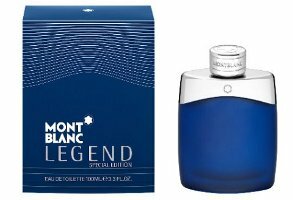 For the first birthday of the already famous masculine fragrance Legend, Mont Blanc launched its reissue—Legend Special Edition 2012. The new fragrance is a refreshed version of the original, a combination of cooling notes suitable for spring and summer. Perfumer Olivier Pescheux gave a cold breeze of aromatic notes to already existing strong woody-fougere composition. Frozen ginger and spearmint provide extra aromatic freshness, backed by "hidden" ingredients of bergamot and mandarin, which extend through the entire fragrance. The composition’s core includes flowers of hybrid lavender, rose and jasmine. The base is recognizable with notes of tonka bean, sandalwood, dry amber and Evernyl molecule (a substitute for oak moss). Montblanc Legend Special Edition 2012 is available in 100 ml Eau de Toilette.